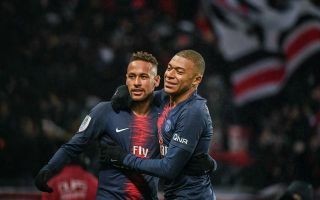 Paris Saint-Germain star Neymar has reportedly been holding transfer talks with Real Madrid in the Spanish capital – but told them about an offer from Manchester United. This is the sensational claim of Spanish source Don Balon, who state Neymar has given a warning of sorts to Real Madrid over a potential move to the Bernabeu. The report claims the Brazil international could either stay at PSG or accept a huge offer from Manchester United, who are ready to pay as much as £300million to bring him to Old Trafford. It remains to be seen how Madrid will respond to this, with Los Blancos surely in dire need of a superstar signing like Neymar to replace much-missed former hero Cristiano Ronaldo. Still, as neutrals, we can hope to see the 27-year-old in the Premier League, in what would no doubt be one of the most exciting transfers in English football history. United need a forward of Neymar’s quality too, with the club still some way off rivals Manchester City and Liverpool and relying on somewhat inconsistent attacking players like Romelu Lukaku and Alexis Sanchez. Attack seems to be a priority for the Red Devils this summer, with big names like Jadon Sancho and Philippe Coutinho also linked with Ole Gunnar Solskjaer’s side by the Independent. More recently, Sport have also linked MUFC as being in pole position to sign Atletico Madrid forward Antoine Griezmann. While any of these would surely be very warmly welcomed at Old Trafford, the signing of Neymar would truly be on another level.